Click here to search for a Workshop or Event Near You! This class is designed to jump start your budding psychic abilities or enhance your already powerful sensitivities and intuition.We all have psychic abilities- we were born psychic. Most of us leave our psychic ability undeveloped where it will find a channel through our dream state or show up randomly and unexpectedly. In this class, we will discuss the different psychic senses and phenomena and discuss ways in which we can develop each. We will practice meditations to discover which psychic sense is our strongest and come to understand how we individually operate as psychic beings.If you are curious about you own psychic abilities, if you want to understand yourself on an energetic level, if you want to increase your psychic channels, then you do not want to miss this class.Come explore your relationship to Energy- how you sense, feel, know and perceive with your psychic senses and abilities and how you can enhance, develop and understand your own psychic-intuitive senses.Be warned… there will be a dramatic increase in your psychic awareness after this class!!!! Some things we will focus on…. I want to thank Ro deeply for having the Psychic Abilities Course. There were so many meaningful moments the depth of the knowledge, the dialogue with the group and the clarity that arose from it all. But what was most important to me was that we keep hearing about how we are spiritual beings and we need to think differently. Well, being a spirit in a human over coat it has been very hard to do that, if not even being able to truly trust what we refer to as God/Spirit Guides/Universe. During the course and the realization that we truly do have Psychic abilities albeit with vary degrees of ability, It has become easier to accept myself as something more than I am and subsequently more able to accept the reality of this amazing spiritual world we are part of. This is truly an amazing life we are living and to have a person like Ro helping us with courses like this only make it that much more meaningful. Wow, another great “Ro” experience! I always learn so much at Ro’s events. This Psychic Abilities course was amazing. I loved the exercises we did that allowed us to tap into our own abilities and see that YES, in fact, I am quite psychic! Thank you, Ro! I came to the workshop with no expectation. But I was blown away with so much knowledge – not just the ‘knowing’ type but the ‘feeling’ as well. Ro is an amazing teacher and guide. She has a beautiful spirit and she has this aura that is loving and true. The divine in me sees the divine in her and my workshop family. Did I say Linda is a great host? She is!! W e all had a great time!! There is a higher and more complex system within and around us that is very present if we could only “see” it. There is a method to get to this place and Ro’s workshop provided the vehicle to understand the psychic world. An important aspect of this workshop is the group experience. Not just definitions of words but practical exercises we all did that demonstrated an ability to go beyond the here and now world we inhabit. It was amazing and we all experienced it. What stands out for me is the affirmation that my psychic powers are worthy of incorporating into my everyday life. I am experiencing a greater understanding of powers that help me to know who I am and were my motivations spring from. Very good stuff! In these 60 to 90 minute group events- the medium will bring forth those Spirits who seek to connect with the audience. As many spirits as time allows will determine who comes through but know each message and connection affects the whole group deeply and profoundly.We all long to connect to our loved ones who have passed and they long to connect to us. They send us signs and wait and hope that the proof they show us will allow us to know our love is not lost and our relationships continue. These group events give them a chance to re-connect or at least, make an appearance! While not everyone’s loved ones come through, their presence is usually more noticeable afterwards. Some Spirits are shy to talk in front of group! Sometimes polite Spirits let another Spirit go first because their message is more urgent and sometimes, we who are living, just need to come and see what this experience is all about. RoseMarie (and sometimes other mediums working with her), will do her best to bring forth as many messages from Spirit as she can. Know the information, insight, healing and love brought through at these events affects all of us in a truly life changing way. For some, a renewal of hope, faith and peace are created. The opportunity to experience greater awareness of SPIRIT’S presence in all of our lives will be available for all of us. Schedule yours today! “My name is Andrea, and we met at the library. I told you that I was desperate to hear from my beloved Grandpa that passed in March and you wrote a note in my book that you would tell my Grandpa to come through. Do you feel connected to Spirit, higher intelligence– a consciousness greater than you? Do you actively call on this source for support to help you in your day to day life? What if you could access this creative force in a tangible, practical and authoritative way? We will discuss this often under-utilized resource and how to work with it in a more conscious and powerful way. We will call on and build our connection to our unseen helpers—who are always helping us anyway whether we believe in them or not- and build our success teams for health and wellness and for financial support, guidance, success, assistance and structure. We will call on the relationship specialists and even the ones for career guidance and direction. Just as there are people with special gifts and skills on Earth that can assist us- Higher Consciousness/Heaven is filled with such guides, teachers, helpers and angels that have specialties too. Come meet the teams, build the teams and work with the behind the scenes helpers that work with you. When you work consciously with your spirit teams you will notice that life just seems to work out easier. Things start falling into place miraculously. Details get ironed out and things come together in a perfect way. You will always be in the right place at the right time, meeting the right people and opportunities and resources show up in unexpected ways. This class can be taken over and over again to gain even more insight, help and support from spirit. This is truly life changing information. Please bring a notebook and pen. Ever wonder who you were in a past life? Or how or if another lifetime is affecting you now? Recalling information and energy from other life experiences can instantly change the reality and experiences of your current life. Illnesses, phobias, anxieties and pain miraculously vanish, relationships heal and transform and financial troubles sometimes disappear. These revealing sessions, done in groups or privately, can help you access the information and insight that will set you free. Join us this afternoon for this transformational and life changing workshop/ meditation and access parts of your SELF that you did not know existed. Have you ever been thinking of someone and suddenly the phone rings and it is them?? Or have a dream about someone or something only to find out what you have dreamed has just happened? Do you feel like sometimes you can read peoples minds, or know what they are going to say before they say it? This is telepathy and we are all naturally born telepaths. Instead of waiting for these coincidences to happen randomly, we can develop this ability and then use it consciously and with greater awareness to enhance our lives and our ability to really truly communicate and be heard. In this meditation, we will practice doing just that. Learn how you can enhance your natural ability to communicate and connect with people and watch how you closest relationships benefit and become more loving and harmonious by using telepathy. Ever wake from a nightmare in total fear? Or have a dream you are convinced is prophecy (going to happen)? Do you remember your dreams? Do you lucid dream? And if not, how can you develop your awareness of your dream state and use it purposely to enhance your life, increase your psychic ability, heal yourself and help others? Working with the dream state is an invaluable tool for consciously (while you are unconscious no less!) connecting more deeply to your intuition and to spirit. Dreams are information from your subconscious, unconscious and higher conscious. Dreams have been recorded throughout history and in EVERY religious text. Psychic information, inspiration (think Beethoven’s Symphony) and much needed daily information is often downloaded and received in dreams. Understanding how to use the dream state to invoke information is one of the greatest tools you can access. Not only will we discuss how to interpret our dreams, but also how to use the dream state for purpose and transformation. Here are just some of the things we will discuss…. 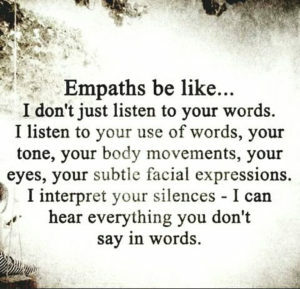 What is an empath? How do you know if you are an empath or have empathic tendencies? More important, how do you manage empathy so it doesn’t manage you? There is a big difference between having empathy and being an empath? “Having empathy means our heart goes out to another person in joy or pain,” says Dr. Judith Orloff. “But for empaths it goes much further. We actually feel others’ emotions, energy, and physical symptoms in our own bodies, without the usual defenses that most people have.” If this describes you, this class is a must. Raising and understanding your Empathic child. How your Empathic Nature affects you mentally, emotionally, physically. 1. Have you ever been label overly sensitive, shy or introverted? 2. Do you frequently get overwhelmed or anxious? 3. Do arguments and yelling make you physically ill? 4. Do crowds drain you? Do you need time alone to revive yourself? 5. Do noise, odors, lights and too much talk overwhelm you? 6. Do you startle easily? 7. Do you react strongly to caffeine, chemicals, and medications or have food and chemical sensitivities? 8. Do you tend to socially isolate? 9. Do you absorb other people’s stress, emotions or symptoms? 10. Do you need a lot of sleep and take a long time to recover after being with difficult people? If you answered yes to 5 or more of these questions you are probably an empathy! Intuitive/Medium/Healer, Hospice Trained Grief volunteer, ordained Spiritual Minister, Certified Hypnotherapist, Yoga Instructor, Reiki Attuned, and BS Physical Education MSU Trained by the best teachers from Arthur Findlay College in England, RoseMarie is a gifted Medium/Intuitive/Healer who has worked professionally in this capacity since 2000. She has connected many people to their loved ones in Spirit through thousands of private medium readings and platform medium demonstrations throughout NJ, NY and Conn. She feels completely privileged and blessed to do this work. Many people claim their lives change dramatically after having a reading with her and that the weight of grief and sadness significantly decreases. She conducts live group classes throughout the tri state area and global webinars on such topics as psychic development, dream interpretation, guided meditation, past life regression, telepathy, spiritual practices and development and more.